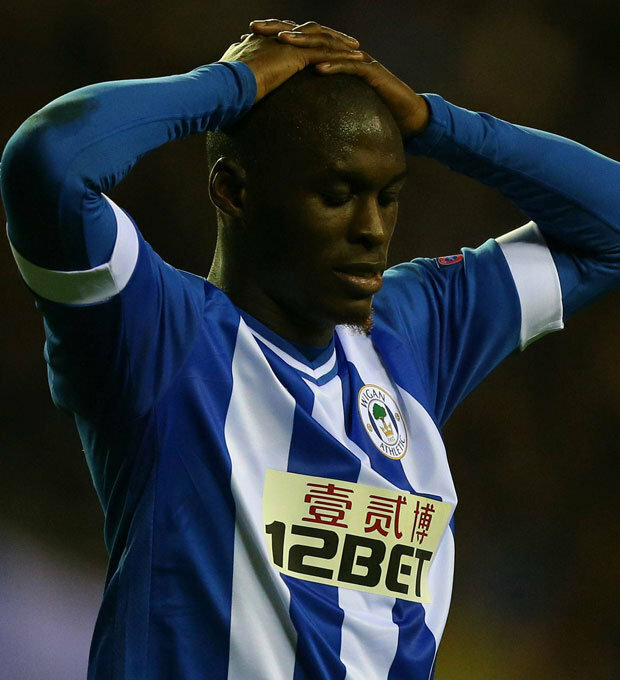 Wigan Athletic were denied a memorable victory against a strong Rubin Kazan side in the dying seconds of the match. Marc-Antoine Fortune’s close range shot had ‘goal’ written all over it but Russian goalkeeper Sergei Ryzhikov made an outstanding save to keep the scores level. Rubin would have counted themselves unlucky had Fortune’s shot gone in as they were the more accomplished side, with players of superior technical ability. It was through sheer determination that Latics managed to claw their way back into the game and almost win it at the end. Owen Coyle left regular league starters Thomas Rogne, James Perch and James McArthur on the bench, bringing in Ryan Shotton, Stephen Crainey and Chris McCann. Jordi Gomez was pushed into a right sided midfield forward role, with Jean Beausejour on the left. Grant Holt and Nick Powell played as a striking duo. The opening minutes saw Latics controlling midfield but creating little danger. They received a wake-up call after 15 minutes when Alexander Prudnikov evaded Leon Barnett’s attempt to play him offside and slotted the ball past Scott Carson with aplomb. The goal knocked the stuffing out of Wigan and the crowd were getting frustrated and were on their backs. Prudnikov seemed to have the freedom of the park at times, roaming around without anyone picking him up. However, a flowing move from Latics saw Holt square the ball across the box but Gomez fired high and wide from a great opportunity. The equaliser in the 39th minute when Ben Watson’s backheel gave Powell the chance to rifle in a fine opportunist low shot from the edge of the penalty area. The goal lifted Latics and they began to more than hold their own through a mixture of skill and resilience. The second half saw neither side dominant as Wigan started to adopt a more direct approach the their play. Ryan Shotton was fortunate to receive only a yellow card in the 49th minute after a scything tackle on the edge of the box. Holt was replaced by Fortune who did well to get past three defenders but could not get enough power behind his shot after 70 minutes. A couple of minutes before Latics had breathed a sigh of relief as Roman Eremenko’s sliding shot was blocked on its way to the net. James McClean had replaced Beausejour after 68 minutes, but the pattern of the game continued. Callum McManaman replaced Gomez in the 75th minute and had a near post shot blocked near the end. Latics continued their aerial bombardment, but Rubin’s big Spanish defenders, Ivan Marcano and the 6’4″ Cesar Navas who was brought on after 67 minutes, were able to repel most of the long balls. In the end it was a point well won by Latics, against the team that will surely win the group. Maribor’s shock 3-1 victory against Zulte Waregem in Belgium has opened up the group and Latics will need at least one good result in the games in Russia and Slovenia and at home to Zulte Waregem to continue to hol second place. Latics could not be faulted for effort. The midfield holding players – Watson and McCann – put in a hard shift, helping to protect their defence, building up attacks. This Latics side does not give up easily and they still stand a good chance of qualifying for the next round. Once more we had a tactical change from Coyle. This time the wide players were more withdrawn towards midfield and Powell was paired with Holt as a central striker, albeit playing a little deeper. Powell is best employed running at the defence from midfield, in the kind of role Shaun Maloney used to play. He is not suited to the long ball game that Latics played too often in the second half. Given Maloney’s absence, possibly for the rest of the season, Powell is going to be a key player at such a young age. Once again we saw Coyle put Gomez in a midfield attacking role on the right. The Spaniard had a nightmare game, slowing down attacks and passing the ball backwards far too often. His lack of defensive cover on the right hand side, put Emmerson Boyce under pressure, especially in the second half when Rubin brought on the speedy Ghanaian Mubarak Wakaso on the left wing. Playing Gomez in that position is not doing him any favours. He can play a useful role in the centre of midfield, either in a holding role or playing in the hole behind the central striker. Once again Latics adopted a long ball game in the latter part of the match. One hopes that Coyle can develop another ‘Plan B’ as the season continues. At times it looked like we were watching a Bolton game. Scott Carson: 6 – only had a couple of saves to make. Emmerson Boyce: 6 – once again played with great heart. His pace is not what it was and he was troubled by Wakaso in the second half. Leon Barnett: 6 – together with Ryan Shotton he forms a physically intimidating centre of defence. However, at times he looked disorientated with the movement of opposition forwards and midfield players. Stephen Crainey: 6 – made a cautious, steady return. Looked solid enough in defence and is clearly working on improving his distribution. Chris McCann: 8 – an excellent performance from the cultured Irishman. Provided good cover for hs defence and put in some nice passes with his educated left foot. Ben Watson: 7.5 – was involved in Wigan’s two best moves of the first half and worked very hard to hold Rubin back. His set piece deliveries were not up to his usual high standard. Jordi Gomez: 3 – poor. Nick Powell: 7 – took his goal really well. A quality player who needs the ball to his feet, rather than in the air. Grant Holt: 5 – looked clumsy and short of pace. Not long back from injury he probably needs more time to get in top shape. Jean Beausejour: 5 – starved of possession and could not get in the game. Marc-Antoine Fortune: – looked more mobile than Holt, but was too often outnumbered by opposition defenders. A pity his last gasp effort did not go in. Callum McManaman: – showed a little more than in recent games when coming on for the last 15 minutes. Let’s hope he can rekindle last season’s form over the coming weeks. James McClean: – worked hard and put in a good defensive stint.